Wednesday, May 8, 2019, 2 – 4:30 p.m.
Critical Acts Resident Artist Gregg Deal delivers a public artist talk. Existence As Protest emphasizes art as a tool, not merely of self-expression but, as importantly, for asserting authority over identity and narrative--a process which often appears as activist or protest art. Deal’s Existence As Protest exhibit opens on Monday, May 13, at Mobius Gallery (Cascadia College). The exhibition includes visual art and “in-studio” live painting and storytelling sessions. Gregg Deal (Pyramid Lake Paiute Tribe) is a provocative contemporary artist who challenges Western perceptions of Indigenous people, touching on issues of race, history and stereotypes. Through his work—paintings, murals work, performance art, filmmaking and spoken word—Deal critically examines issues and tells stories of decolonization and appropriation that affect Indian country. Deal’s activism exists in his art, as well as his participation in political movements. 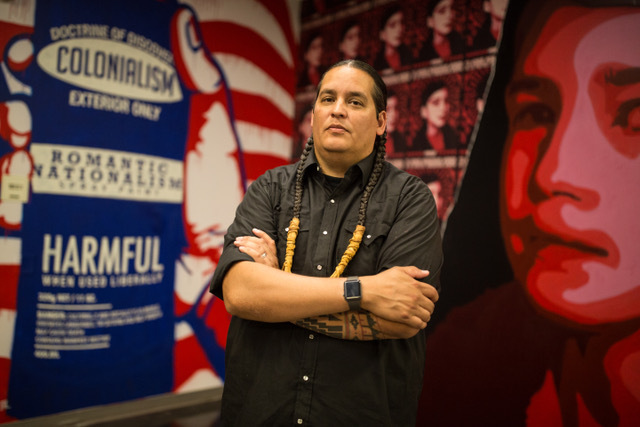 He has been heavily involved with #changethename movement, creating a #changethename video on Vimeo inviting Indigenous people to weigh in on the sports mascots issue in response to mainstream media’s failure to center Indigenous voices in the conversation. Most recently, a photograph of Deal was included in the December 2018 National Geographic Society Magazine article “Native Americans are Recasting Views of Indigenous Life.” Deal was Native Arts Artist-in-Residence at Denver Art Museum in 2015-2016 and Artist-In-Residence at UC Berkeley 2017-2018. His art has been exhibited nationally since 2002. Deal has lectured widely at prominent educational institutions and museums, including Denver Art Museum, Dartmouth College Columbia University, and the Smithsonian National Museum of the American Indian. His television appearances include PBS’s The Art District, The Daily Show and Totally Biased with Kamau Bell.